Living in a time where we turn our resources into waste in high speed makes me very much wonder about the time where our planet’s virgin materials will be depleted. 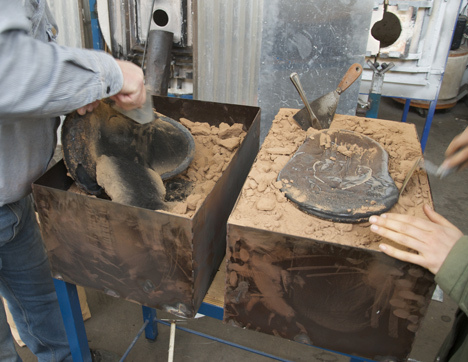 Our constantly growing world population leads to a growing demand for materials. Since materials are fundamental to everything we engage with, new ways of manufacturing them are needed. Is there a way to turn all our waste back into resources? Diving back into the mystical secrets of twelfth-century Alchemy led the Amsterdam based designer duo Studio Drift to a way of transforming our chemical waste into something new. By processing initially considered intractable chemical residual material, Studio Drift explores an entirely new way of gaining a material resembling to the volcanic glass Obsidian [x]. 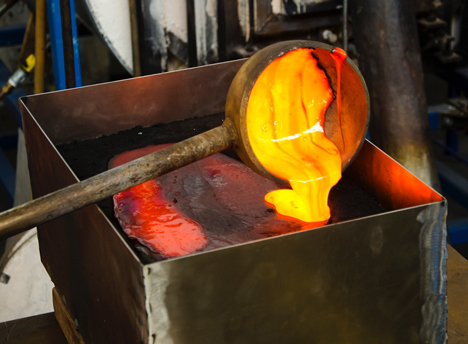 After a particular heating process, the glowing mixture can be poured into molds and the obtained outcome is a material with its very own unique characteristics. It sounds like metal, looks like glass and is heavy as a stone. 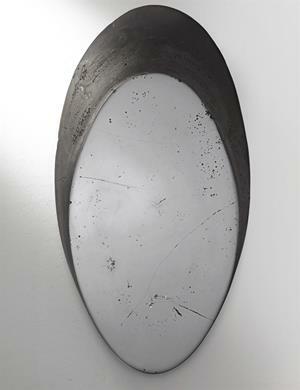 When I look in the polished black surface of this synthetic obsidian, my own effigy gets reflected by the waste. But do we even need all those resources to produce materials we can only hardly recycle later? While many designers are intently trying to close the cycle of production and recycling to support a circular economy, alternative ways of producing material without any need of resources are considered. The current generation of designers, alchemists and scientists are crossing the boundaries to explore the unexplored and reshape the future by growing living organisms as materials. Dealing with a lot of various materials in my every-days study awakes huge interest in the process of replacing toxic materials with long-term, sustainable material solutions. Following the steps of designers and scientists I started to research about approaching materials in unconventional ways. With the advancements of synthetic biology a palette of futuristic ways to grow material by itself are evolved. To gain a better understanding of the process and potential of these materials, I started a project of exploring one of those self growing organisms myself. 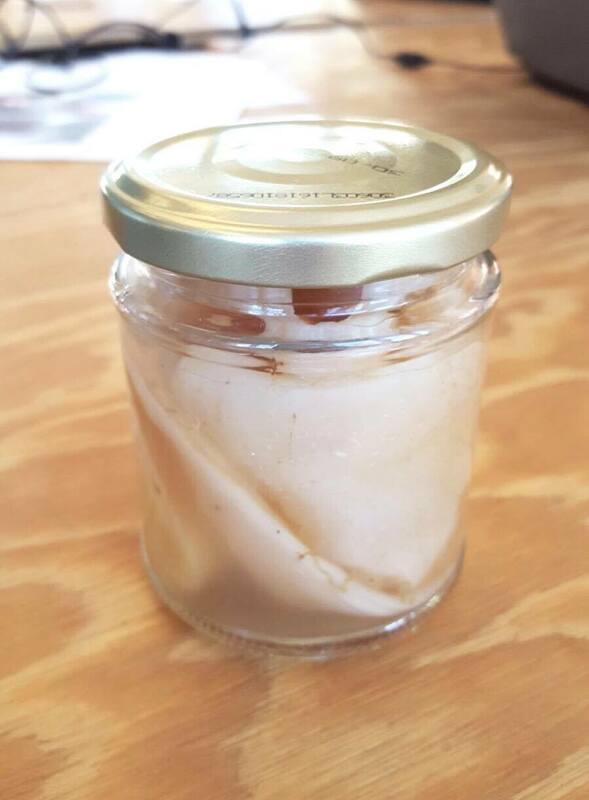 Inspired and fascinated by bio-materials that grow by themselves I decided to explore Mycelium, a material grown out of convenient Mushrooms such as Fungi. A small research led me to Mediamatic, where I met Wouter Hass, the expert mycologist and owner of the Amsterdam-based Mycophilia. With a lot of enthusiasm he gave me a closer insight in his work. In a mostly self-built laboratory he searches for the unexplored potential of Fungi. 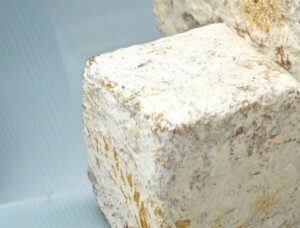 Not only as regards taste he admires the mushroom, he also grows big blocks of Bio-Material out of it, which can be used as isolation and packaging material and later be composted. After our interesting conversation about the whole process, I could not wait to gave it a try myself. 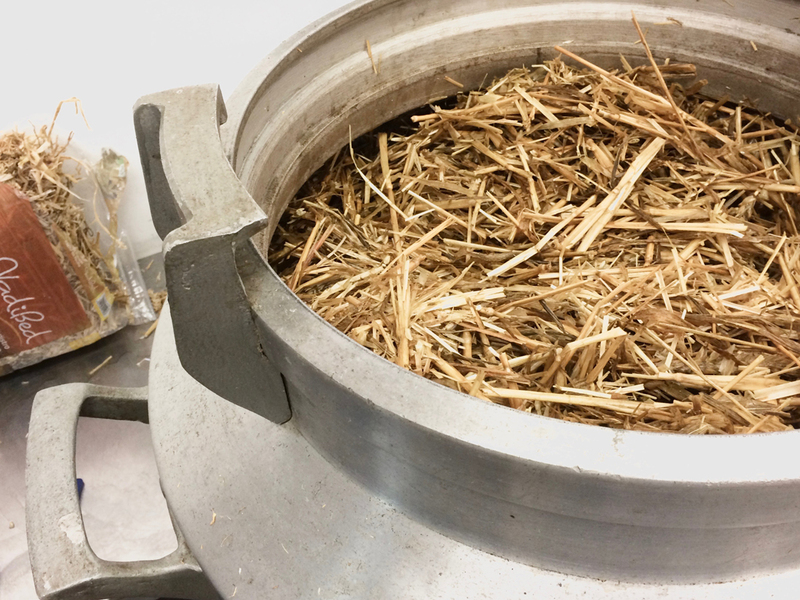 Following Wouters instructions, I sterilized straw by cooking and cultivated it with Fungi spores. 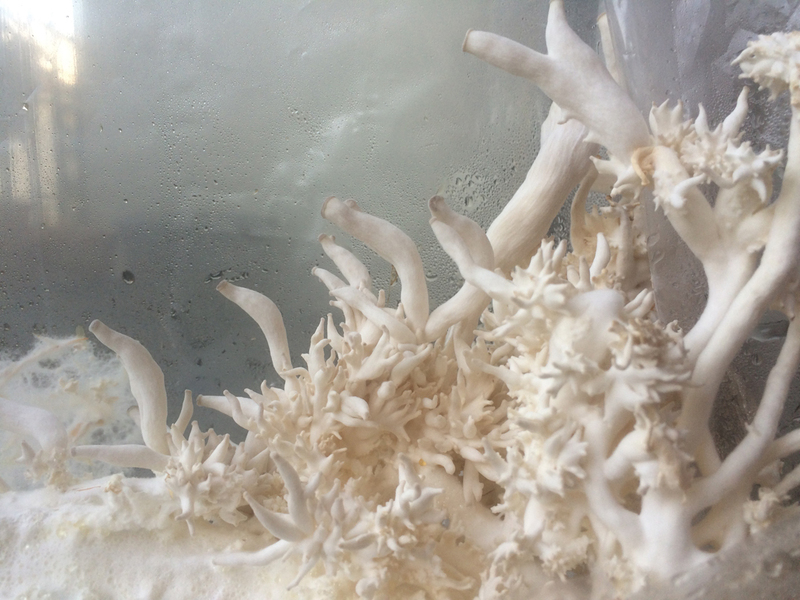 Stored in a plastic bag in the dark, fruiting bodies constructed by white fungal network with reproductive structures are growing. These structures are called Mycelium. In the woods these strains transfer the nutrients, as well as they detoxificate dead plants. After a few weeks it grew to a block which I now separated in pieces. These pieces I placed together with jute in a mold, made out of two buckets. Humidified and covered by a foil it is stored in the dark of my closet again. If everything works out well, the pieces will soon grow together and overgrow the jute. 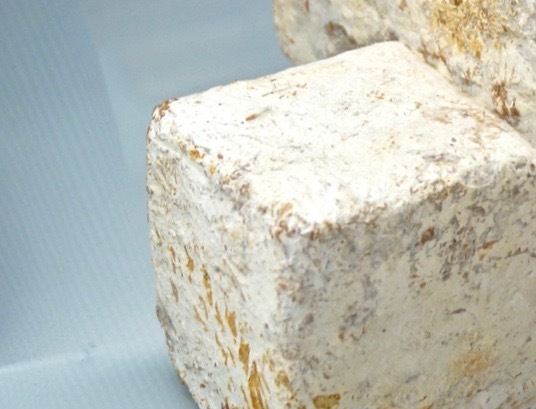 By further developments of Mycelium, many ecologically harmful materials could probably be replaced by a fully compostable product that merges science and nature. Another ongoing personal research of growing materials is about bacteria. By culturing the bacteria of Kombucha in sugared tea, a healthy drink is made.Further than that it grows a slightly transparent surface. As soon as this surface reaches the desired thickness, it can be removed and dried to a skin-like material. An inspiring conversation at the pop up Pet-Shop [x] from Waag society made me curious to give it a try myself. Fashion designers such as Suzanne Lee [x] and Sacha Laurin [x] are important pioneers in growing clothes from bacteria. A closer look into the usage of grown textile is given in the very interesting blogpost ‘Bio Fashion Future Fashion‘ by Alba. Considering one kilogram of cotton requires 23.000 l water and mostly grows in developing countries, Kombucha couture seems like a fundamental step into a more economical future to me. The palette of possibilities of synthetic materials gained without using the world’s last resources is literally growing in many directions. Other impressive designers such as Laura Lynn Jansen & Thomas Vailly even found a way of growing Stoneware which can be seen here. I consider those developments of biologically grown material as a good start to solve one of our biggest global issues and I am very curious about the first outcome of my own try outs which i want to keep updated here. 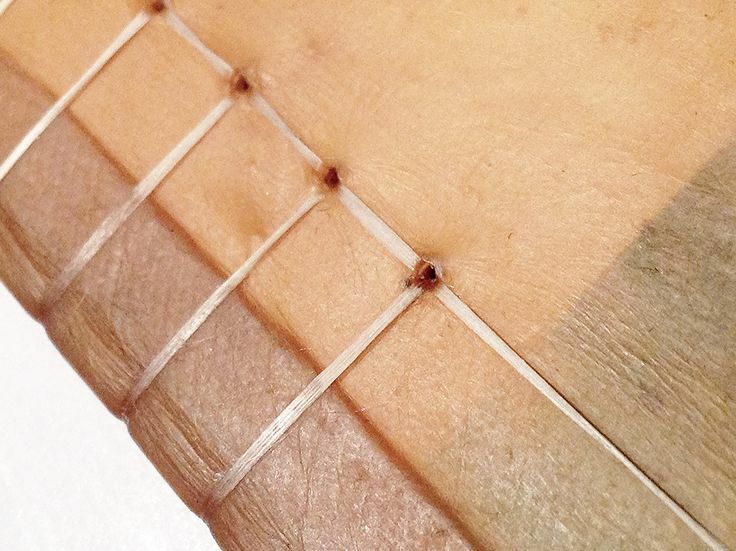 Meanwhile Deezen has some really nice articles to read more about synthetic material.